We need to understand the responsibilities, capabilities, expectations and competencies of the Data Engineer, Data Scientist and Business Stakeholder. One of the most exciting challenges I have at Hitachi as the Vice-Chairmen of Hitachi’s “Data Science 部会” is to help lead the development of Hitachi’s data science capabilities. We have a target number of people who we want trained and operational by 2020, so there is definitely a sense of urgency. And I like urgency because it’s required to sweep aside the inhibitors and resistors to change. 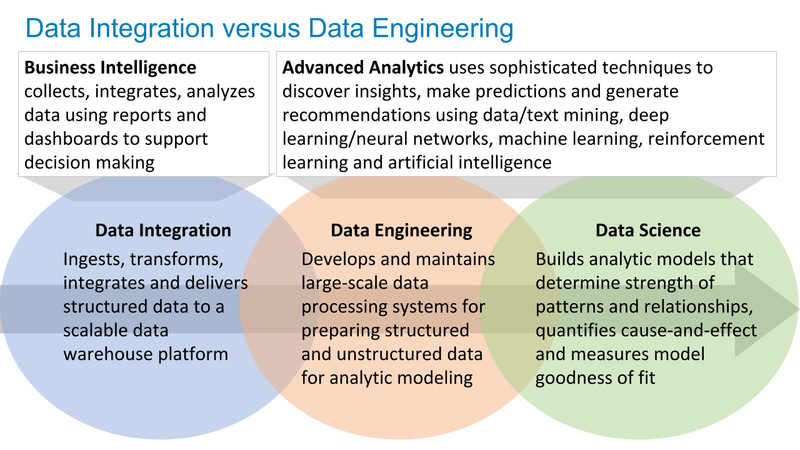 I started this assignment with a blog titled “What’s the Difference Between Data Integration and Data Engineering?” that laid out the differences between traditional Data Integration and modern Data Engineering (see Figure 1). But that blog only addressed the Data Engineer role. 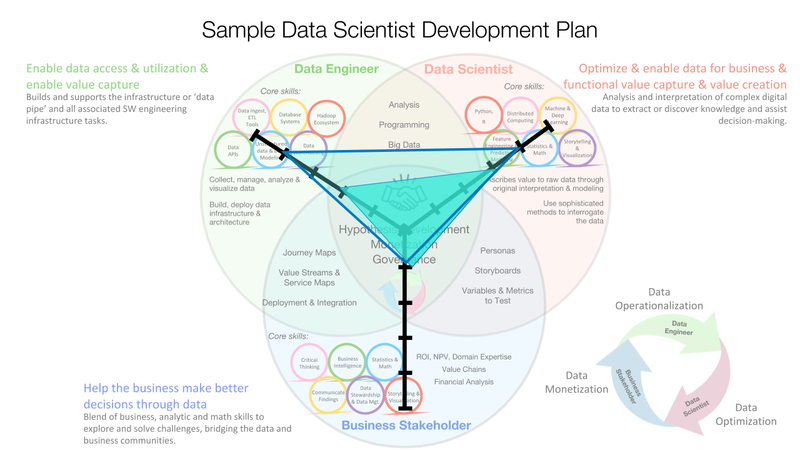 To achieve the goals for the “Data Science 部会” – which is to become more effective at leveraging data and analytics to optimize key business and operational processes, mitigate compliance and security risks, uncover new revenue opportunities and create a more compelling, differentiated user experience – we need to consider three key roles, and the interaction between those three key roles, that round out the data science community. We need to understand the responsibilities, capabilities, expectations and competencies of the Data Engineer, Data Scientist and Business Stakeholder. We started this assignment by researching the job hiring profiles of Data Engineers and Data Scientists at the Silicon Valley’s leading data science organizations (Thanks John!). 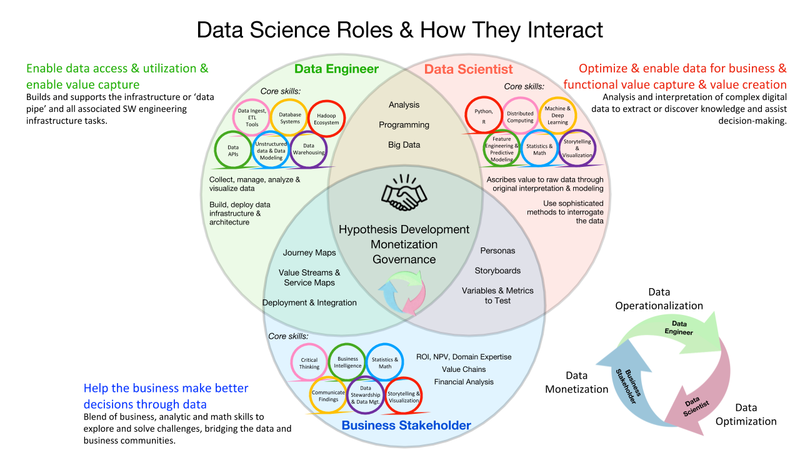 We then created a graphic to highlight the focus and capabilities of those roles, as well as the interactions between those roles – the Data Science Capabilities Venn Diagram (see Figure 2). Note: I’ll dive into these points of innovation and their role in driving digital transformation and data monetization in more detail in a future blog. The supporting details of the research can be seen in the Figure 3 eye chart. This is a great foundation that helps us understand what skills we are going to need to hire and/or develop. However, the chart in of itself isn’t yet enough. We now need to turn this research into something actionable. Our next step was to lay Spider charts on top of the Data Science Capabilities Venn Diagram. We can then use the Venn Diagrams to not only assess the current capabilities of the data science community, but now we have the basis, or benchmarks, against which we can build individualized development plans to improve the data science capabilities across all three roles. Figure 4 shows an example of such the mapping exercise for a Junior Data Scientist with whom we want to develop their data engineering skills. Again, we can use the Data Science Capabilities Venn Diagram Spider Chart to assess the current capabilities of this individual across all three dimensions, and then put together a personalized training program or curriculum to advance them along the different dimensions. 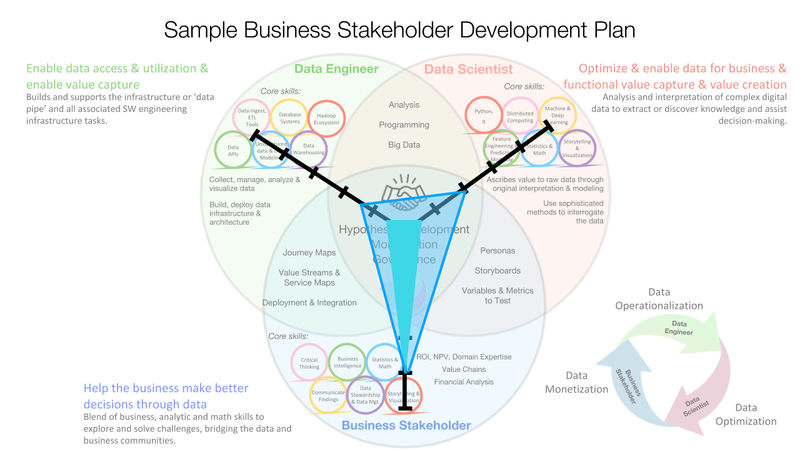 Figure 5 shows another example of using the Spider Chart to improve the data science and data engineering awareness of a Business Stakeholder. Next step will be to refine the gradients that differentiation junior from senior to master data scientists and data engineers, and then create the curriculum and content to get there. Hello Global Learning team! Data science is a team sport comprised of Data Engineers, Data Scientists and Business Stakeholders. And like a baseball team can’t function effectively with only shortstops and catchers. 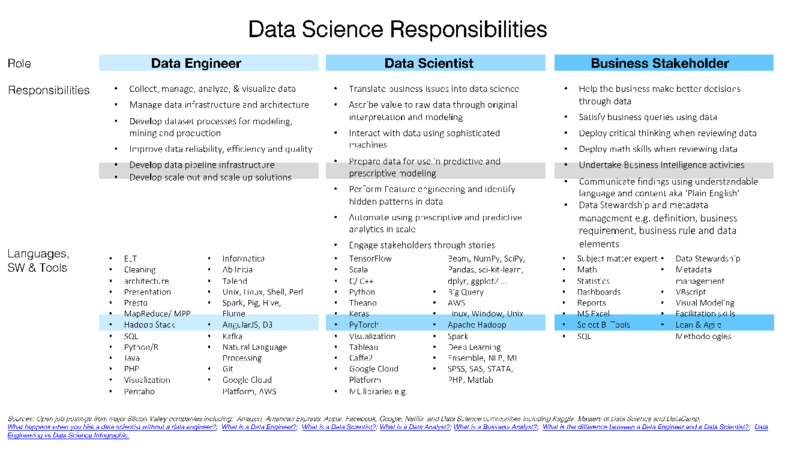 One’s data science initiative MUST clearly articulate the roles, responsibilities and expectations of the Data Engineers, Data Scientists and Business Stakeholders. If the goal of your organization is to become more effective at leveraging data and analytics to power your business models and drive digital transformation, you can’t win that game with a team full of pitchers. Right, Alec?